Louis-Dreyfus was a junior at Northwestern, active in the school's drama department and performing with Second City, when she auditioned for Saturday Night Live. She was with the show from 1982-85, and had two quickly-cancelled sitcoms before Seinfeld (The Art of Being Nick and Day by Day) and one after (Watching Ellie). 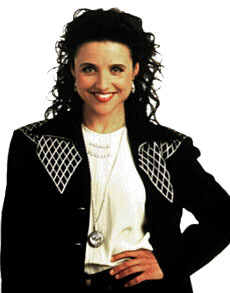 "Elaine" was added to Seinfeld for the second episode, when executives thought the show needed to offset its three male characters. Her character was not in the original pilot. Unlike Elaine, who dated dozens of men during Seinfeld's run, Louis-Dreyfus' first and only serious boyfriend was comedian and writer Brad Hall. They met at Northwestern, and both worked on Saturday Night Live, where Hall anchored "Weekend Update." They have been married since 1987, and in real life she goes by the name Julia Hall. Her grandfather, Pierre Louis-Dreyfus, was a war hero of the French Resistance in World War II. She is also "very, very distantly" related to actor Richard Dreyfuss and falsely convicted French military officer Alfred Dreyfus. Her father, Gerard Louis-Dreyfus, runs Louis-Dreyfus Group, a multi-billion dollar diversified commodities, energy, shipping, real estate, manufacturing, and communications conglomerate. Her great-great-grandfather, Leopold Louis-Dreyfus, founded the firm in 1851, and experts estimate she will inherit more than half-a-billion dollars upon her father's death.